National Jewish Hospital for Consumptives. One of the United States of North America; bounded on the north by Wyoming and Nebraska; east by Nebraska and Kansas; south by Oklahoma and New Mexico; and west by Utah. It was admitted into the Union in 1876. The excitement consequent on the discovery of gold at Pike's Peak in 1858, following the panic of 1857, which clogged the wheels of industry in the Eastern States, brought the first settlers to Colorado. There were no railroads; and the pioneers crossed the plains and mountains in wagons drawn by oxen or horses. Among the Jews who survived the hardships of the long journey, the perils from wild animals, and the attacks of savage Indians, were Isidor Deitsch, Leopold Mayer, A. Jacobs, A. Goldsmith, F. Z. Salomon, D. Kline, and others. Denver, the capital of Colorado and the most important city of the Rocky Mountain region, was settled in 1858-59, and gradually became the center of Colorado Jewish life. In 1861 the United States government deeded to Denver a plot of ground ted for burial purposes; of this the Jews were allotten acres. A Cemetery Association was the first Jewish organization. 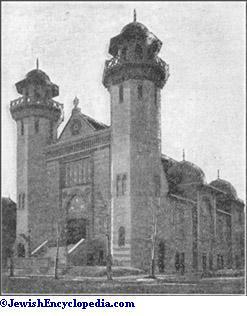 In 1873 the Jews of Denver organized for worship, and in 1874 built Temple Emanuel, a small synagogue at 19th and Curtis streets. The members were for the most part energetic merchants of German birth. By 1882 Congregation Emanuel had outgrown the little synagogue, and a larger one was constructed at 24th and Curtis streets. This building was destroyed by fire Nov. 5, 1897, and a beautiful structure on 16th avenue and Pearl street was erected, and dedicated Jan. 29, 1899. Rabbis Block, Elkan, Schreiber, J. Mendes de Solla, and William S. Friedman have successively occupied the pulpit. A Ladies' Auxiliary, a Jewish Relief Society, mainly for indigent consumptives, and aburial society, Ḥesed Shel Emeth, have also been established; and four Orthodox congregations are in existence. 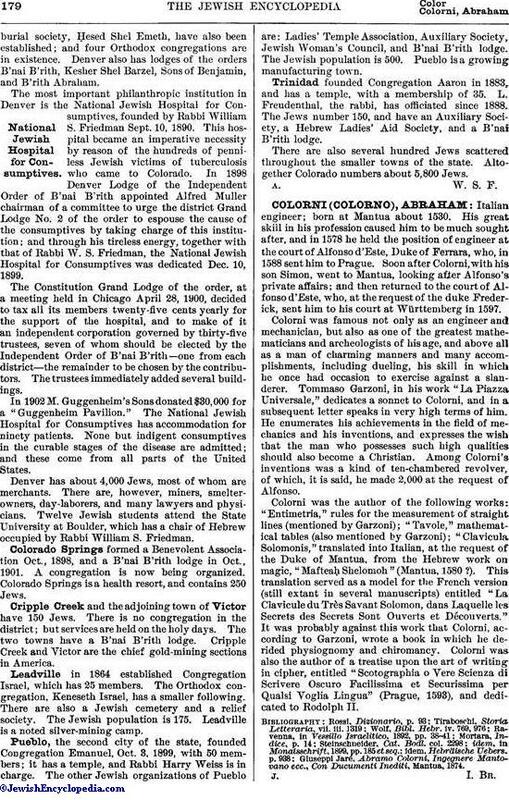 Denver also has lodges of the orders B'nai B'rith, Kesher Shel Barzel, Sons of Benjamin, and B'rith Abraham. The most important philanthropic institution in Denver is the National Jewish Hospital for Consumptives, founded by Rabbi William S. Friedman Sept. 10, 1890. This hospital became an imperative necessity by reason of the hundreds of penniless Jewish victims of tuberculosis who came to Colorado. In 1898 Denver Lodge of the Independent Order of B'nai B'rith appointed Alfred Muller chairman of a committee to urge the district Grand Lodge No. 2 of the order to espouse the cause of the consumptives by taking charge of this institution; and through his tireless energy, together with that of Rabbi W. S. Friedman, the National Jewish Hospital for Consumptives was dedicated Dec. 10, 1899. The Constitution Grand Lodge of the order, at a meeting held in Chicago April 28, 1900, decided to tax all its members twenty-five cents yearly for the support of the hospital, and to make of it an independent corporation governed by thirty-five trustees, seven of whom should be elected by the Independent Order of B'nai B'rith—one from each district—the remainder to be chosen by the contributors. The trustees, immediately added several buildings. In 1902 M. Guggenheim's Sons donated $30,000 for a "Guggenheim Pavilion." The National Jewish Hospital for Consumptives has accommodation for ninety patients. None but indigent consumptives in the curable stages of the disease are admitted; and these come from all parts of the United States. Denver has about 4,000 Jews, most of whom are merchants. There are, however, miners, smelter-owners, day-laborers, and many lawyers and physicians. Twelve Jewish students attend the State University at Boulder, which has a chair of Hebrew occupied by Rabbi William S. Friedman. Colorado Springs formed a Benevolent Association Oct., 1898, and a B'nai B'rith lodge in Oct., 1901. A congregation is now being organized. Colorado Springs is a health resort, and contains 250 Jews. Cripple Creek and the adjoining town of Victor have 150 Jews. There is no congregation in the district; but services are held on the holy days. The two towns have a B'nai B'rith lodge. Cripple Creek and Victor are the chief gold-mining sections in America. 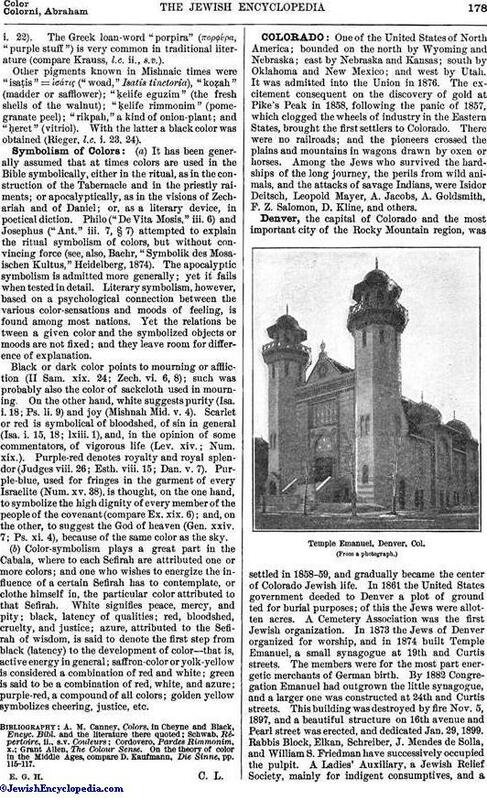 Leadville in 1864 established Congregation Israel, which has 25 members. The Orthodox congregation, Keneseth Israel, has a smaller following. There are also a Jewish cemetery and a relief society. The Jewish population is 175. Leadville is a noted silver-mining camp. Pueblo, the second city of the state, founded Congregation Emanuel, Oct. 3, 1899, with 50 members; it has a temple, and Rabbi Harry Weiss is in charge. The other Jewish organizations of Pueblo are: Ladies' Temple Association, Auxiliary Society, Jewish Woman's Council, and B'nai B'rith lodge. The Jewish population is 500. Pueblo is a growing manufacturing town. Trinidad founded Congregation Aaron in 1883, and has a temple, with a membership of 35. L. Freudenthal, the rabbi, has officiated since 1888. The Jews number 150, and have an Auxiliary Society, a Hebrew Ladies' Aid Society, and a B'nai B'rith lodge. There are also several hundred Jews scattered throughout the smaller towns of the state. Altogether Colorado numbers about 5,800 Jews.